The quasi-government group follows one rule: the U.S. has an unqualified right to do unto others what others may not do unto the U.S.
“They’re meddling in our politics!” That’s the war cry of outraged Clintonites and neocons, who seem to think election interference is something that Russians do to us and we never, ever do to them. But meddling in other countries has been a favorite Washington pastime ever since William McKinley vowed to “Christianize” the Philippines in 1899, despite the fact that most Filipinos were already Catholic. Today, an alphabet soup of U.S. agencies engage in political interference virtually around the clock, everyone from USAID to the VOA, RFE/RL to the DHS—respectively the U.S. Agency for International Development, Voice of America, Radio Free Europe/Radio Liberty, and the Department of Homeland Security. The last maintains some 2,000 U.S. employees in 70 countries to ensure that no one even thinks of doing anything bad to anyone over here. Then there is the National Endowment for Democracy, a $180-million-a-year government-funded outfit that is a byword for American intrusiveness. The NED is an example of what might be called “speckism,” the tendency to go on about the speck in your neighbor’s eye without ever considering the plank in your own (see Matthew 7 for further details). Prohibited by law from interfering in domestic politics, the endowment devotes endless energy to the democratic shortcomings of other countries, especially when they threaten American interests. In 1984, the year after it was founded, it channeled secret funds to a military-backed presidential candidate in Panama, gave $575,000 to a right-wing French student group, and delivered nearly half a million dollars to right-wing opponents of Costa Rican president Oscar Arias—because Arias had refused to go along with our anti-communist policy in Central America. A year later, it gave $400,000 to the anti-Sandinista opposition in Nicaragua and then another $2 million in 1988. 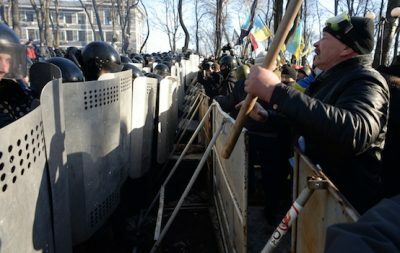 It used its financial muscle in the mid-1990s to persuade a right-wing party to draw up a “Contract with Slovakia” modeled on Newt Gingrich’s Contract with America; persuaded free marketeers to do the same in Mongolia; gave nearly $1 million to Venezuelan rightists who went on to mount a short-lived putsch against populist leader Hugo Chavez in 2002; and then funded anti-Russian presidential candidate Viktor Yushchenko in Ukraine in 2005, and the later anti-Russian coup there in 2014. What all this had to do with democracy is unclear, although the NED’s role in advancing U.S. imperial interests is beyond doubt. Rather than “my country right or wrong,” its operating assumption is “my country right, full stop.” If Washington says Leader X is out of line, then the endowment will snap to attention and fund his opponents. If it says he’s cooperative and well-behaved, meaning he supports free markets and financial deregulation and doesn’t dally with any of America’s military rivals, it will do the opposite. It doesn’t matter if, like Putin, the alleged dictator swept the last election with 63.6 percent of the vote and was declared the “clear” winner by the European Union and the U.S. State Department. If he’s “expanding [Russia’s] influence in the Middle East,” as NED President Carl Gershman puts it, then he’s a “strongman” and an “autocrat” and must go. The U.S. was apparently not just a nation, but something like a religion as well. Additional input for the new NED in 1983 came from spymaster William Casey, CIA director from 1981 to 1987, who, after the intelligence scandals of the 70s, had swung around to the view that certain covert operations were better spun off into what the British call a “quango,” a quasi-non-government organization. It was a case of covert backing for an overt turn. The result was an ideologically lethal package that assumed whatever Americans did was democratic because God is on our side, that old-fashioned CIA skullduggery was passé, and that the time had come to switch to more open means. In the interests of pluralism, the NED adopted a quadripartite structure with separate wings for the U.S. Chamber of Commerce, the AFL-CIO, the GOP, and the Democrats, each working separately yet somehow together. But when the House voted unexpectedly to defund the agency in 1993, beneficiaries sprang to its defense. Major-league pundits like George Will, David Broder, and Abe Rosenthal “went into overdrive,” according to The Nation, as did the heavy hitters of the Washington Post editorial page. Vice President Walter Mondale, a member of the NED board of directors, worked the phones along with Lane Kirkland, George Meany’s successor as head of the AFL-CIO. Ronald Reagan wrote a letter, while Senators Richard Lugar, Orrin Hatch, and John McCain pitched in as well. So did prominent liberals like Paul Wellstone, John Kerry, Tom Harkin, Ted Kennedy, and Carol Moseley-Braun. These people normally couldn’t bear to be in the same with one another, but they were of one mind when it came to America’s divine right to intervene in other nations’ affairs. The anti-NED forces didn’t stand a chance. Twenty-five years later, the endowment is again under attack, although this time from the right. Gershman started the ball rolling when, in October 2016, he interrupted his busy pro-democracy schedule to dash off a column in the Washington Post accusing Russia of using “email hackers, information trolls and open funding of political parties to sow discord” and of “even intervening in the U.S. presidential election.” Since there was no question whom Russia was intervening for, there was no doubt what the article amounted to: a thinly veiled swipe at a certain orange-haired candidate. “The work our government does to promote democratic values abroad is at the heart of who we are as a country,” added Senator John McCain. America is democracy, democracy is America, and, as history’s first global empire, the U.S. has an unqualified right to do unto others what others may not do unto the U.S. Only a “Siberian candidate,” “a traitor,” or “a Russian stooge” could possibly disagree. Daniel Lazare is the author of The Frozen Republic: How the Constitution Is Paralyzing Democracy (Harcourt Brace, 1996) and other books about American politics. He has written for a wide variety of publications from The Nation to Le Monde Diplomatique, and his articles about the Middle East, terrorism, Eastern Europe, and other topics appear regularly on such websites as Jacobin and Consortium News.